Claude Monet experimented with light throughout much of his career. In 1890, he was painting his famous Haystacks series showing the effects of sunlight on bales of hay. Also in 1890, and continuing again in 1891, Monet was working on another series. In Poplars, Monet again set out to show fleeting moments in changing light. During the time Poplars was painted, Monet lived in Giverny, France. In the summer of 1890, he went to the river Epte and began his long process of painting the poplar trees that lined the edge of the river. Some paintings were done from the banks of the river, while others were done from a boat, specially outfitted to allow Monet to paint and store the many canvases he had available. In some of Monet’s series paintings the composition doesn’t change, as in the Rouen Cathedral paintings. The Poplars series can be divided into two categories; paintings showing a few trees spanning the picture plane and rising above the top of the canvas, or paintings showing the poplar trees in a row going back into the distance. The first group, those that show three to seven trees are the more abstract of the series. In those paintings, Monet shows the trunks of the trees with their tops out of view, off the top of the canvas. Their reflections can be seen in the water below divided by the bank of the river and its reflection on the water. Between the trunks there is the hint of more poplar trees; however, they are almost indistinguishable as trees as Monet painted them almost to abstraction. In the second group, where Monet shows the trees along the bank going off into the distance, we see more traditional landscape paintings. In those we see trees, with their leaves, along the bank of the river. The trees, clouds, and river are all recognizable. However different the compositions are, the ideas behind them are the same. The theme that stays with Monet for decades is light. In Poplars, like many of his series, the desire to capture the subtle differences in light throughout the day is what kept Monet painting. Because Monet was painting these trees in sunlight that would change as the minutes passed he had to have different canvases ready at any time. He also had to return day after day, over a two year period. Each painting had to be continued at the same time every day to get the same light effects. Monet’s paintings appear to be done spontaneously and quickly a result of the visible brushstrokes and the short timeframe he had to get the changing light. A closer look reveals the layers of paint showing that these paintings were done over many sessions. After Monet stopped painting the poplar trees that first year, as winter came, the trees were set to be sold. Monet, not finished with his paintings, had to pay to keep them from being cut down so he could return the next year and continue painting. The Poplars series is similar to his Haystacks and is done at the same time both showing how different light can change how we perceive color. 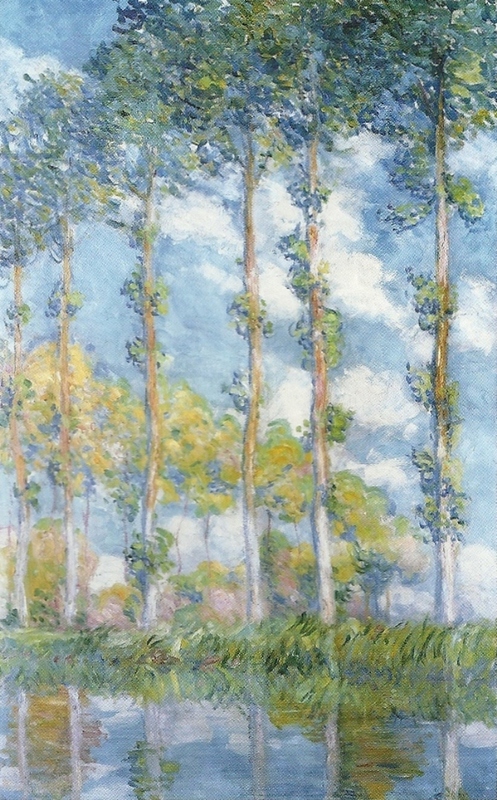 Monet takes Poplars and brings them to more abstraction, focusing on color more than subject.